You may have heard something in the news about the water crisis in Flint, MI. Residents of Flint have been living with tainted and contaminated water from lead and other toxins thanks to cost-cutting measures. The problem started back in 2014 when the city of Flint announced plans for a new pipeline to deliver water to the city from Lake Huron. While that construction was underway, they temporarily turned to Flint River for a water source. Residents of Flint began noticing that their water tasted, smelled, and looked funny. In 2015 Virginia Tech and the Environmental Protection Agency performed tests that found dangerous levels of lead in water being delivered to homes. 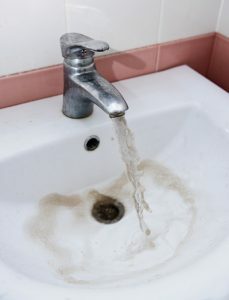 Lead exposure can cause problems for the heart, nerves, and kidneys. For children, it can also cause impaired cognition, delayed puberty, hearing problems, and behavioral disorders. It was also discovered that just about half of the service lines delivering water to homes in Flint were made of lead which began leaching into the water supply because the water was not being properly treated. Several lawsuits have been filed against the city of Flint and the state of Michigan for monetary compensation as well as refunds for water bills. 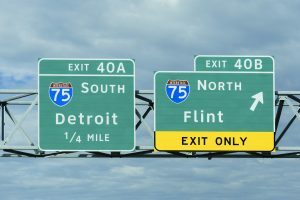 The federal government and the state of Michigan both declared the water situation in Flint a state of emergency. Even though this story has dropped out of the headlines, the crisis remains ongoing. The water is still not safe to drink without using a filter, and most families use bottled water to drink, cook, bathe, and brush their teeth. More than a dozen local and state officials have been criminally charged and some of them could face years in prison. Millions of dollars have been spent and the city has switched to Detroit’s water supply. The quality of the water has improved but is still not safe. Make sure your family is drinking clean water by scheduling your free water analysis. Call Schultz Soft Water at 800-289-2807. We know that drinking plenty of water is important for our health, but did you know what drinking too much water can actually be a bad thing? Drinking too much water can lead to overhydration or water intoxication. While it’s recommended that we consume eight glasses of water per day, your kidneys can only handle so much at a time. A healthy person’s kidneys can excrete about six gallons of water per day and no more than one liter per hour. That means if you drink more than a liter in one hour, you can become overhydrated. The most common side effect is frequent urination, but there are other more serious side effects that can develop. Drinking too much water too fast can actually have a negative impact on your brain. Drinking large amounts of water increases how much water is in your blood. That water can dilute electrolytes like sodium, and when those levels drop too low hyponatremia sets in. At that point, fluids will shift to the inside of cells and cause them to swell, which can be life-threatening in some cases. While you should still be sure to drink enough water, drinking too much too fast can lead to these conditions. Drinking the recommended eight 8-ounce glasses of water per day can easily be handled by your kidneys if you don’t drink it all at once. The kidneys can accommodate roughly 200 ounces per day, but if you try drinking all eight glasses in a one or two-hour period you can certainly become overhydrated. You can still drink plenty of water as long as you pace yourself over the course of the day. Remember that beverages other than water can also contribute to overhydration, as can certain foods high in water content. For a free water analysis contact Schultz Soft Water at 800-289-2807. Soap scum built up from hard water can be stubborn and difficult to get rid of. 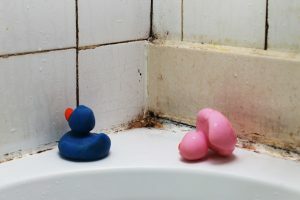 While the best solution is to get rid of the hard water in the first place, you’ll still need to clean up that soap scum. You can make your own powerful soap scum cleaner using just two common products. You’ll need some Dawn dishwashing liquid, white vinegar, and an empty spray bottle. Combine one cup Dawn into a 32-ounce spray bottle and fill the rest of the bottle with white vinegar. Shake the bottle gently to mix after putting the sprayer top on. Once your solution is ready you can begin removing that soap scum. Spray the mixture liberally on the area you are cleaning. Allow it to sit for at least 30 minutes and up to overnight if needed. Rinse away the grime that should have become soft and gooey. If you need to, use a brush or sponge to scrub the surface and then rinse. After you’ve cleaned off the built-up soap scum, you can go on a weekly maintenance plan to keep things clean. Keep the spray bottle handy and spray down the shower’s walls, doors, faucets, and tracks. You can even do this while you’re in the shower and then before you step out you can rinse them off using the shower’s handheld sprayer. You can also use this spray in the kitchen for appliances, sinks, and faucets. Getting rid of hard water is the best way to get rid of soap scum for good. Hard water can also cause dry hair and skin, spots on glasses, fixtures, and silverware, and rings on bathtubs. Schultz Soft Water would be happy to provide you with a free water analysis. Give us a call today at 800-289-2807 to learn more. 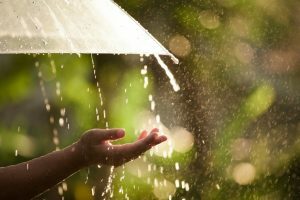 As a kid, you may have enjoyed playing in the rain, and many children like to try to catch some of it in their mouths to drink. It may seem like rainwater would be safe to drink because it hasn’t become contaminated, but is that really the case? As rain passes through the atmosphere it picks up contaminants that are in the air, so it’s not as pure as you might think. As rain lands, it can pick up chemicals from landing on plants or buildings or other structures. 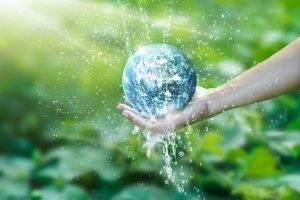 While many people in the world use rainwater as their main water supply, the water picks up bacteria, pollution, mold, pollen, and other contaminants. You can treat rainwater to make it drinkable by using water purification tablets or boiling it. You can also use a water filtration system if you prefer to drink water from rain to conserve resources. In most areas, it’s also difficult to collect enough rainwater to drink. Rainwater can be used for gardening, dishwashing, and toilet water, but many water experts don’t recommend drinking it. Rainwater tanks contain many contaminants including microorganisms, bacterias, and traces of toxic metals. You can also find bird and animal droppings and the bacterias we are talking about are serious strains like E. coli. No matter where you get your drinking water from, it’s recommended that you use a drinking water system or specialty treatment system. A drinking water system from Schultz Soft Water provides your family with an unlimited supply of high-quality drinking water right from the tap. It improves the taste of your water and filters out harmful chemicals, bacteria, and metals. To learn more or schedule an appointment give us a call today at 800-289-2807. Water is one of the most abundant natural resources, but it still needs to be conserved. Many areas of the U.S. struggle with droughts which means taking steps to converse water is especially important. Conserving water can also save you money on utility costs. Keep reading to learn about some relatively easy ways to conserve water. Use a Shower Bucket – We all know that at the beginning of a shower you need to allow the water to warm up to your desired temperature. During that time water is just being wasted down the drain. Putting a bucket under the faucet can catch that water so you can use it for other purposes like watering plants. Once the water is warm enough to start bathing, simply place the bucket outside the shower. Turn Off the Faucet – You’ve probably been told that you can turn off the faucet while you’re brushing your teeth. Water comes out at about 2.5 gallons per minute, so in less than 30 seconds you can conserve a gallon by turning it off and then back on when you need it again. You can also do this when you wash your hands. Fix Leaks – Plumbing leaks can waste a lot of water. Check for leaks yourself or have a professional do so. Even a small leak could be wasting gallons of water each day. Many times fixing the leak will pay for itself in the amount of water you save. Watering Lawns – Even during the summer, lawns don’t have to be watered every single day. You can get by with watering your lawn two to three times per week. You should also avoid watering your lawn between normal business hours of 9 a.m. to 5 p.m. During those times, water evaporates pretty quickly so your watering job won’t be as effective. For all your home water questions, contact Schultz Soft Water today at 800-289-2807. 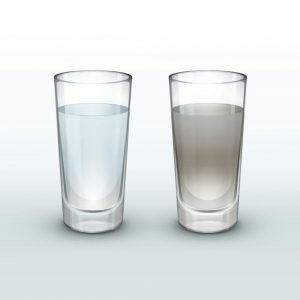 Water is the most important thing you can drink, but some people struggle to drink enough because they don’t like the taste. If you find the taste of water to be too boring, you can dress it up with a variety of naturally flavored fruits to make it tastier. Try some of these ways to make your water taste better. Citrus Squeeze – Lemons and limes go great with water. Cut off a section and squeeze it into your water for a natural boost in flavor. This is similar to using lemon for iced tea. 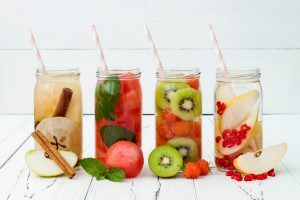 Fruit Infusion – There are many types of fruits that can give your water a subtle flavor upgrade. Whether you use an orange, apple, berries, or melons, allowing them to seep into your water makes it taste much better. Add Some Sparkle – If you find plain water too boring, you may prefer sparkling water. Use raspberries or blueberries to provide a more natural soda alternative. Add a Splash – Even if what you are drinking is only 90% water, it’s still considered drinking water. Add a splash of unsweetened cranberry juice for a flavor pick-me-up. Ice Cubes – Try making some ice cubes from no-sugar-added juice for a nice treat to the everyday glass of water. Get Creative – You don’t always have to use the same fruits in your water. Try some interesting flavors like sliced cucumber or fresh mint leaves. Flavor Mix – Try using a low-calorie mix such as Crystal Light or Lipton Green Tea to give our water a totally different flavor. Many homeowners notice that their water has a chlorine taste and smell or other unpleasant tastes and odors to it. In addition to not tasting good, this water may be dangerous for your family. To schedule your free water analysis contact Schultz Soft Water at 800-289-2807. Have you ever filled up a glass of water and noticed that it looks cloudy or milky? If so, chances are you didn’t worry too much about it because the water cleared up after a few seconds. Cloudy water is often caused by the pipes that deliver it being under a lot of pressure. More likely, it’s caused by tiny air bubbles in the water itself. The good news is that cloudy or white water is harmless if it’s caused by air bubbles. This condition is more likely to occur during the winter months. Cold water can hold more air than warm water, which can produce those air bubbles when you fill up your glass. While your water is in pipes it’s under a certain amount of pressure which causes it to hold more air. As soon as it comes out of the tap, it’s no longer under the same pressure and produces bubbles similar to a carbonated drink. All you really need to do is let the water sit in an open container until the bubbles disappear and the water clears up. There are other reasons why your water may appear cloudy, and those may require some treatment. Tiny particles from rocks, sand, and dirt can also get trapped in your water supply. They are typically harmless although not aesthetically pleasing. Allow your water to sit undisturbed. If the water does not clear up, particles are likely the source. You can have your water treated with a sediment filter to remove the particles. Although it’s quite rare, methane gas can also cause water to be cloudy. This can actually make your water flammable and can be difficult to detect. In this case, your water should be aerated. While cloudy water is usually harmless, you don’t want to take any chances when it comes to your family’s health. Schedule a free water analysis with Schultz Soft Water today by calling 320-251-4100. 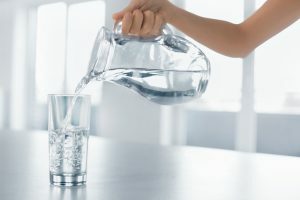 By now you’ve surely been told to drink plenty of water every day, but many people still have trouble consuming the recommended amount of eight 8-ounce glasses per day. Given the fact that our bodies are about 60% water, it makes sense that we need to replenish our supply daily. While your doctor might have told you to drink lots of water, they probably didn’t go into detail about the benefits of drinking the proper amount of water every day. Maximize Physical Performance – Just like your car can’t run very well without enough oil, your body needs enough water to perform at a high level. Just losing 2% of your body’s water content is enough to cause dehydration. Athletes can lose up to 10% of their water weight through sweat, so it’s especially important for them to stay hydrated and drink plenty of water. Brain Function and Energy Levels – Much like our bodies, our brains also need water to perform optimally. Mild dehydration can impair brain function, mood, concentration, and increase headache frequency. It can also lead to feelings of fatigue and anxiety as well as memory. Weight Loss – Drinking lots of water may actually help you lose weight. That’s because water can increase your body’s metabolism. It’s recommended that you drink water a half hour before you eat a meal. You will feel fuller and likely consume fewer calories. Dieters who followed this practice were able to lose 44% more weight over a 12-week period. A drinking water system from Schultz Soft Water can improve the taste of your drinking water so you are more likely to enjoy its benefits. Give us a call today at 320-251-4100 for more information. 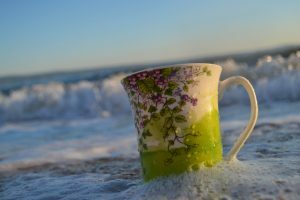 You might think that water is water and that it would always look and taste the same, but that certainly isn’t the case. There are plenty of factors that influence the taste, color, and smell of water. Some of these issues come from the source of the water or the delivery method. Check out these four signs you have water problems and how you may be able to solve them. You have grayish white film on your dishes and in your sinks. This likely means that you have hard water from calcium or magnesium. Hardness can also cause reduced suds in laundry and can cause water heater elements to fail. You’ll need a water softener to solve the problem. Your water has a metallic taste or leaves colorful stains. The likely culprit here is iron which can leave behind red, orange, or brown stains on dishes and produce an undesirable taste. You should look into a water softener or an oxidizing filter. Your water has black specks or appears black or grey. These signs likely mean that your water has too much manganese. It can also produce metallic tasting water and standing water in your bathtub or toilet tank will have a dark appearance. You will want a water softener for lower concentrations or an oxidizing filter for higher ones. Your water has a salty taste to it. This probably means there is too much chloride in your water. This can also cause the corrosion of metals. You should look into a distillation or reverse osmosis system at your individual taps. You might be better off drinking water from another source such as water bottles. These common water problems can be solved quite easily so you can rest assured your family has safe and pleasant tasting drinking water. Contact Shultz Soft Water at 320-251-4100 to learn more. Kids love beverages that aren’t necessarily good for them like juice and sugary sodas. Because it doesn’t contain sugar and they also don’t know the benefits of drinking it, getting your children to drink enough water can be quite a challenge. Make them realize they’re thirsty. 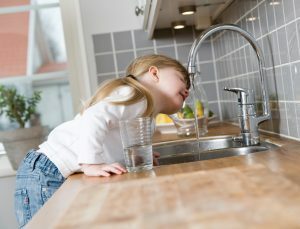 Most of the time children drink something because it tastes good, not because they know they need to drink more fluids. Hand your kid a water bottle and ask them to take a few sips. You’ll likely find that they will drink more than that because once they start drinking they’ll realize they’re thirsty. Make drinking water fun. Simple things like a fun cup or a silly straw can make drinking water more fun for kids. Special cups such as those with their favorite characters can also make young children want to drink more water. You can also dress up their water with fruit to make it look nicer. This will also add to the flavor so they may be more likely to enjoy it. If you have trouble getting your kid to drink plain water, try adding some of these fun elements into it. Limit their beverage options. If you have a fridge full of soda, juice, and other beverages, your child will be more likely to prefer them. Try to limit what you have available to just water, milk, and some juice with no sugar added. You can try alternating these drinks throughout the day to make sure they get enough water. Practice proper portion control. Don’t give your small child a big water bottle and expect them to finish the whole thing. Purchase some small 4-ounce water bottles so they’re easy to carry and consume. If they prefer drinking out of a glass, make sure it’s of a reasonable size for kids. To schedule a free water analysis, contact Schultz Soft Water at 320-251-4100.